Home » Posts » From the President » Deep Freeze Warning: Pets lives endangered! 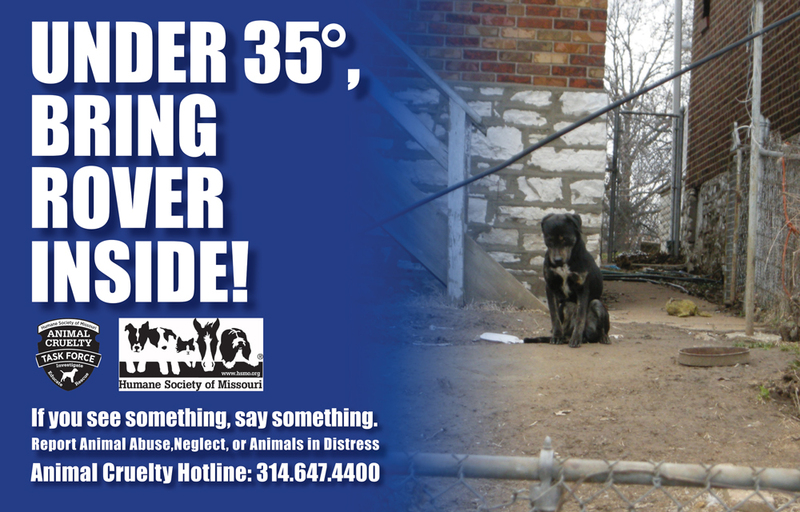 Under 25° - keep pets inside! In these extreme cold temperatures, your pet’s life can be endangered if it’s left out in the cold. Even a dog house with straw may not be enough to protect them from hypothermia! It’s tempting to think your pet’s fur will keep them warm while they’re outside or that a dog house is sufficient to protect them but sadly, some animals could perish. Imagine if you were outside for an hour or two, even with a winter coat on, you, too, would struggle to maintain your body heat to protect you from harm. If it’s dangerously cold for you, it’s dangerously cold for your pet! 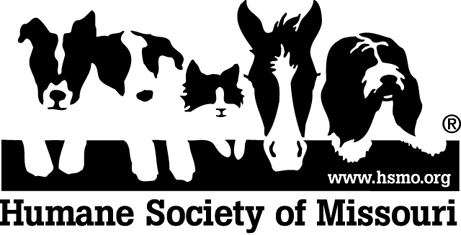 The Humane Society of Missouri is concerned that pets left outside in extreme temperatures may be at risk of injury or death! Throughout the winter season, remember these tips to keep pets healthy, happy and protected. Bring pets inside: Just like people, cats and dogs are susceptible to hypothermia and frostbite and should not be left outside in the cold for prolonged periods of time. Thick-coated dog breeds are more tolerant of cooler weather, but beware of freezing temperatures or wind chills that make it feel much colder. Too cold for outdoor pets: Even a well-insulated, draft-free, appropriately sized doghouse with a sturdy, flexible covering to prevent icy winds from entering may not be enough for the average pet in extreme weather. In this situation, bring your pet into a warm area. Outdoor water bowls that have frozen into ice do not provide enough water for your pet to survive; replenish regularly. Never attempt to ‘heat’ an outdoor dog house! Take extra care of frail pets: young or elderly dogs and cats or pets that have chronic health issues are more susceptible to experiencing discomfort and may be impacted much faster than other pets when the temperatures are extreme. Press “paws” on pet injuries: Check your animals’ paws frequently for signs of cold-weather damage, such as a cracked paw pad or bleeding. Even short walks could result in injury to pets’ paws as de-icing products like rock salt can irritate footpads. If you choose to run during extreme cold temperatures, leave your pup at home. Layer up your pup: If your dog has a thinner coat or seems bothered by cooler temperatures, consider a sweater or a dog coat. But be careful – a wet sweater or coat can actually make your dog colder. A wet pet is a cold pet, so be sure to dry off pets (and their clothing!) to keep them comfortable. Prevent poisoning: Make sure to clean up any antifreeze spills or buildup quickly. Pets may find it smells and tastes sweet, but it is poisonous and can cause serious health issues. If a pet accidentally ingests antifreeze, contact your veterinarian immediately. Schedule a winter wellness exam: If your pet has not visited the veterinarian for his or her yearly wellness exam, now is the perfect opportunity. Cold weather may worsen certain medical conditions such as arthritis, so prep your pet for the winter season by visiting the vet! Be advised, owners of pets injured or killed by extreme temperatures could face criminal charges for failing to provide adequate care and shelter.